Alt.Estate is the first tokenization project with a viable go-to-market strategy. Our offer to market players provides clear economic incentives to use and promote our Protocol using their marketing budgets. This whitepaper outlines the Alt.Estate value proposition, the marketing strategy, the business model, and the token distribution details. Alt.Estate tokens (ALT) will be distributed among buyers during the crowdsale, the dates of which will be announced later. Alt.Estate’s Vision Is to Promote Blockchain Technology in Real Estate by Creating Clear Economic Incentives for Market Players. We look forward to a brilliant future where all real estate registries are based on blockchain technology and can be combined into a transparent and secure worldwide distributed ledger that allows users to trade real estate fast, without intermediaries and with low transaction costs. We are eager to partner with all government and private projects to make this future come true faster. Although direct interaction with governments is very important in the long term, business is much faster to adopt innovations, especially when they directly affect financial results. Promotion of blockchain technologies to business leaders will increase the lobby for further steps in the adoption of blockchain registries. We offer real estate market players our Protocol for real estate tokenization, and the Platform for exchanging tokenized real estate assets. Tokenization enables trading real estate in small fractions, and makes it accessible as a result. Sellers attract new buyers who could not afford to buy real estate before, didn’t have the opportunity to invest internationally, didn’t want to bear high transaction costs, or wanted to pay for real estate with cryptocurrency. Buyers are additionally motivated by the transparency and liquidity provided by the secondary market within the Platform and the secure transaction records stored on the blockchain. 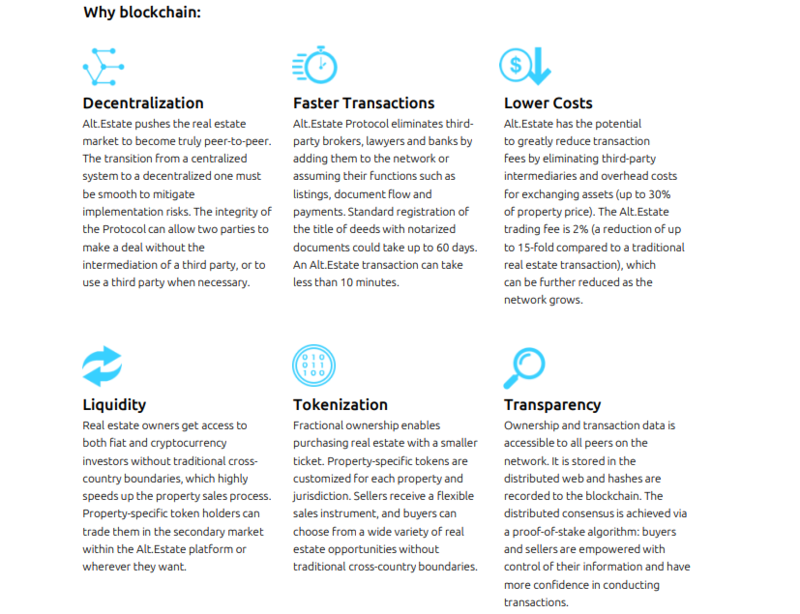 Alt.Estate makes it possible to buy and sell tokenized real estate assets in a trusted, fast and smooth manner with instantaneous transactions and low transaction costs. Any real estate owner can list his property or any fraction of it on the Platform, and anyone can become a buyer as the entry ticket is very low. We are the first real estate tokenization project with a viable B2B marketing strategy. We will provide our solution to real estate developers, investment companies and brokers. As they are interested in any new sales channels, we can use their marketing budgets to promote our tokenization Protocol and quickly fill our exchange with tokenized real estate from all over the world. 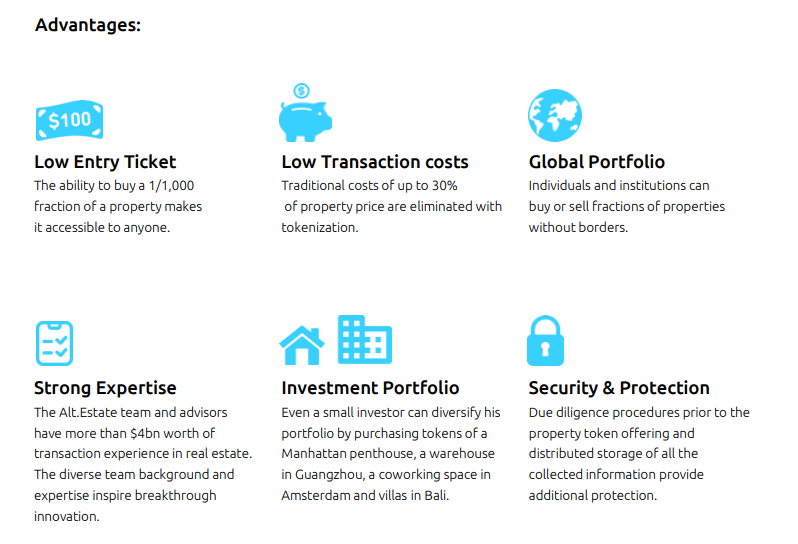 Alt.Estate Solves the Main Problems of Traditional Real Estate Investments. The total value of world real estate reached $217 trillion in 2015 and is worth nearly 2.7 times the global GDP.1 This number includes only developed real estate, and would have been much larger had we counted the vast amount of undeveloped land around the globe. Although the real estate market has plenty of opportunities for making big gains, investing in real estate is a lot more complicated than investing in stocks and bonds. All of them have been addressed many times throughout history . New investment vehicles have been invented which solve some of those problems, but there is no perfect solution, and the real estate market is still the most inefficient one compared to other asset classes. Core concept developed.Team established. Alt.Estate team with $400m worth of real estate deals, includes professionals with a strong background in real estate, investments, finance, marketing and operations. Advisory board formed. Advisors with more than $3 billion worth of transactions in real estate join Alt.Estate.Alt.Estate blockchain architecture development initiated.Alt.Estate tokenized apartment prototype goes live. Registration, authorization and licensing in the first jurisdictions. Start of the first EU law-compliant real estate token sales on Alt.Estate Platform. Alt.Estate Protocol goes live. Technology, legal and corporate structure modules are united under the Alt.Estate Protocol for tokenizing and selling properties globally. Promotion of the Alt.Estate Protocol as a turnkey solution for real estate developers, brokers, and investment companies. Going global. Full deployment of the Alt.Estate go-to-market strategy. Alt.Estate Protocol becomes an industry standard. 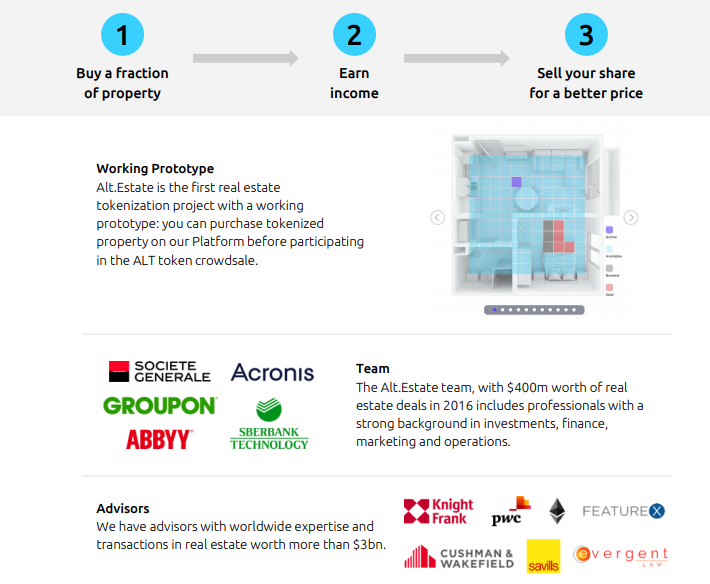 Alt.Estate Platform is #1 crowdfunding and trading platform for tokenized property.